You’ve heard the talk about social media listening but now you want to know how to put it to use. Listening isn’t a fad and it’s not going away as long as there are online discussions to monitor. These conversations are a significant source of intelligence for your marketing efforts if you know how to incorporate them into your strategy. To review what social media listening is and how it’s different from monitoring, check out our thorough listening guide here. This article is meant to be a practical, how-to guide to social listening for social media marketing professionals. In it, we’ll review how you can use social media listening for your company or organization, as well as proving its value to the C-suite. Incorporating social media listening into your overall digital marketing strategy has several important benefits. These advantages span the entire company, from product development to customer service. Immediate research: Analyzing current social media listening data provides you with immediate research that does not need to run through focus groups or other in-person structured analyses. This data is also in real time, providing you with the most accurate findings for timely action. More affordable: Coordinating focus groups and hiring marketing research agencies can be pricey. Social media listening can be performed at a lower cost than traditional research methods while returning a potentially wider sample of individuals. Preventative: When you execute social media listening, you’re paying attention to trends and common service complaints. This sort of listening prepares you to take action if needed and prevents a potential backlash to your company. Depending on how your social media listening is set up, you may find it easier to create and maintain than other research methods. Demographic data is easily available to social media managers already and Twitter advanced search techniques can be executed in minutes. With less cost and time to set up, you’ll free up more resources to take action on your findings. The clearest use for social media listening is a brand analysis. It’s also very likely that you have the tools in place for this already. To perform a brand analysis, you’ll need data like what keywords are often mentioned with your brand, what customers are talking about online about you and how are they reacting to your products. A brand analysis ranges from an overall company sentiment to a product-level sentiment. You’ll want to set up social media alerts that cover this range. For a general analysis, a quarterly check-in is acceptable while a more timely one might be necessary for campaigns. A word cloud like the above helps you understand what is most commonly associated with your company. If the words that show up are desired, then you’re on the right track. If not, then it means you need to understand why they’re there and plan on how to change it up. Another valuable source of information is the sentiment report. Enter brand names here and see what percentage of the online discussion is positive or negative. 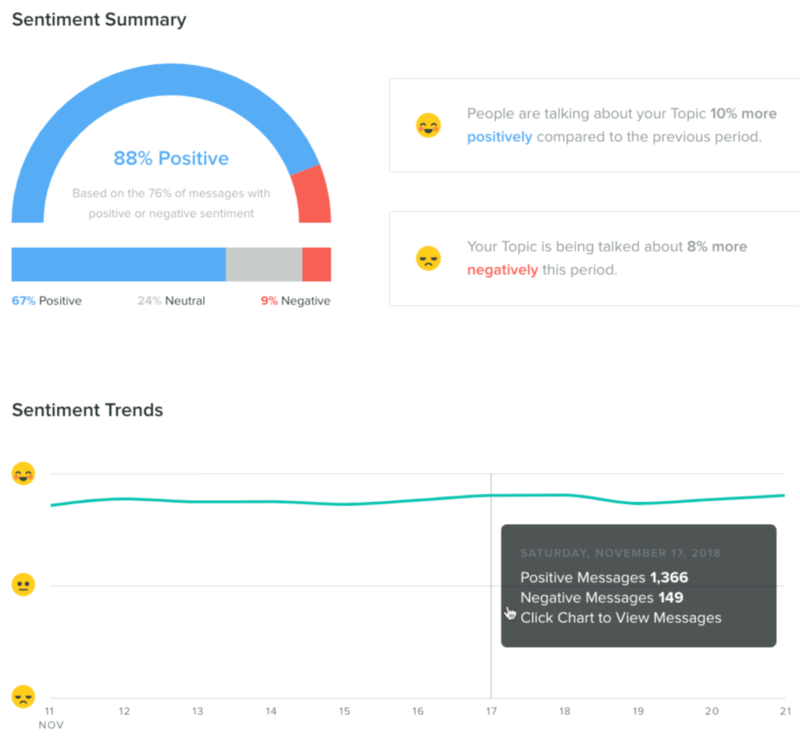 In Sprout’s own Sentiment Summary, as shown above, there you can easily view percentages and the trends over any course of time. If you check in on this report on a regular basis, you’ll be able to identify negative trends before they become a catastrophe. One of the most useful parts of social media listening for marketers is its value for conducting a competitive analysis. Checking out what your competitors are doing well, where you can fill in the gap and what their customers complain about will inform your marketing strategy. Our guide to competitive research with listening deep dives into this type of data. 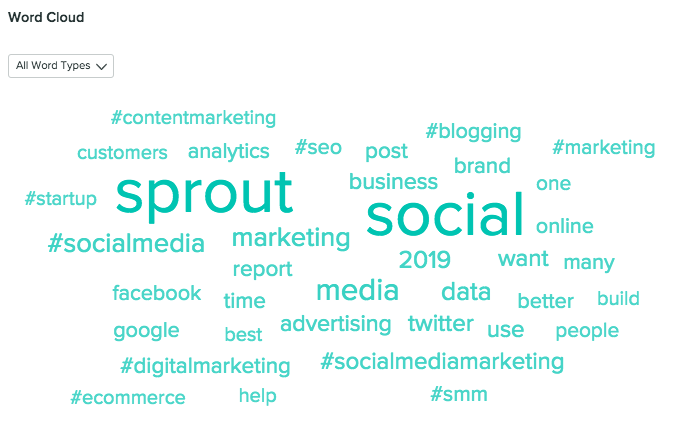 The Sprout Listening report generates themes around the topic you’re looking at. Create one for your competitor and see where they’re performing well and where they could improve. Another component of the competitor analysis is the share of voice (SOV). This means how much digital space your brand’s voice is taking up in conversations. Are you mentioned more often than your competitors? Where are you dominating the conversation? Identify your competitor’s weakness is not talking about the value of hydration for their sports drink. Create your next marketing campaign around hydration. See that the competitor’s most common complaint is unresponsive customer service. Check your own service model and establish one or speed it up. Notice that their latest campaign had dominated the online conversation but most of the time, customers are discussing your products. No need to act on this information except for a pat on the back for yourself. You likely already look at how well your content is performing but do you go beyond that data to find content inspiration? 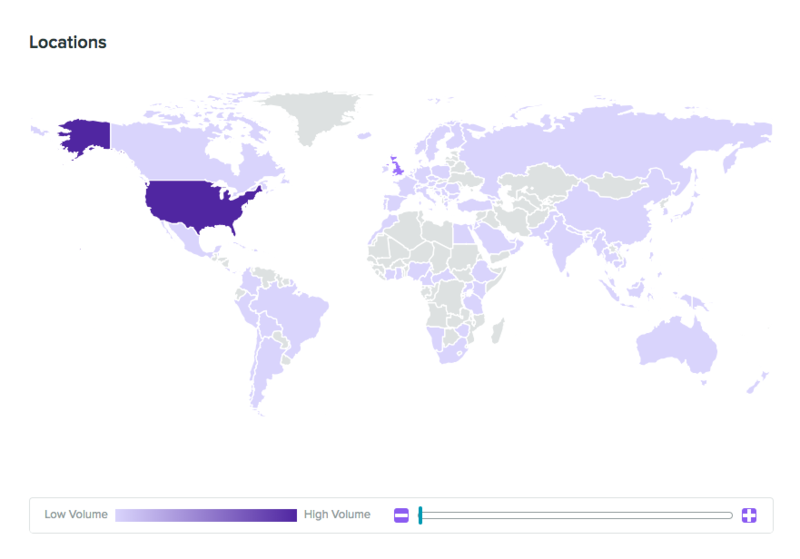 Use social listening to see what others are discussing. 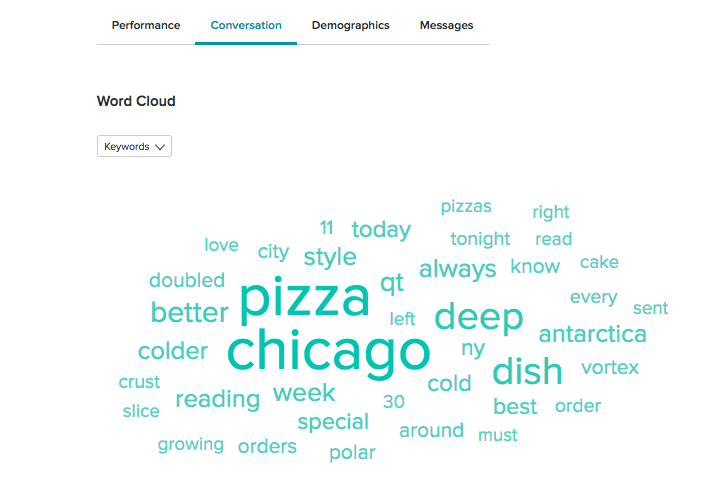 By creating a word cloud around “pizza” and “Chicago,” you can easily see which other words are also being used. Now is a good time to talk about your delivery services, especially if it’s feeling like Antarctica outside. Let’s say you have multiple products in your sports clothing lineup. Which ones are being discussed more and which are not? Perhaps your sweats line needs a little more attention online. You could use this data to add more sweats-oriented content or create a campaign around it. 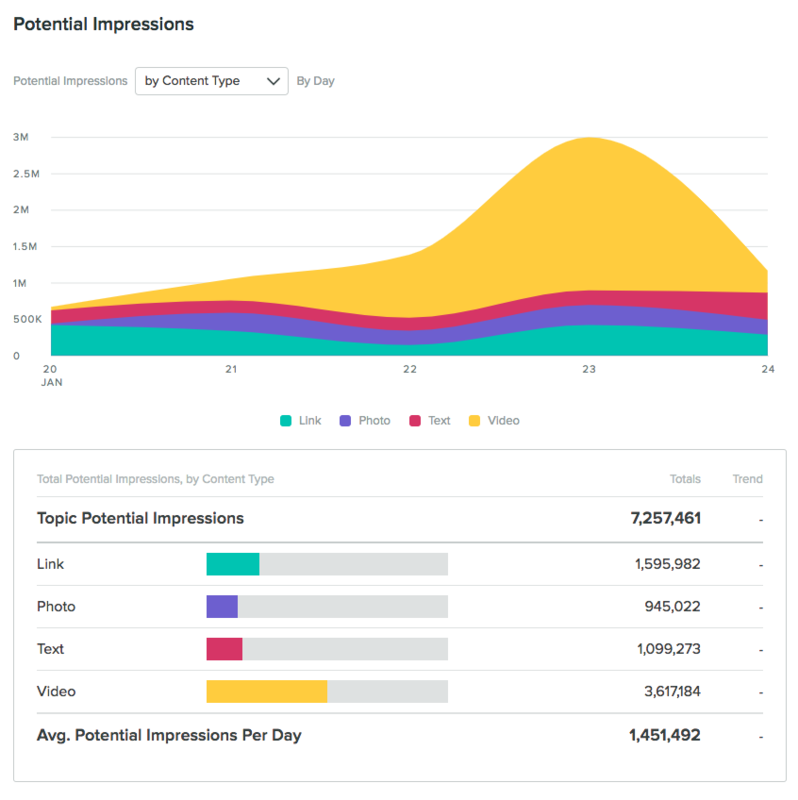 And finally, a potential impressions report helps you predict how one type of content will perform. Are you having trouble deciding if your pizza campaign should be in a video or text? Use a report to help you decide instead of flipping a coin. 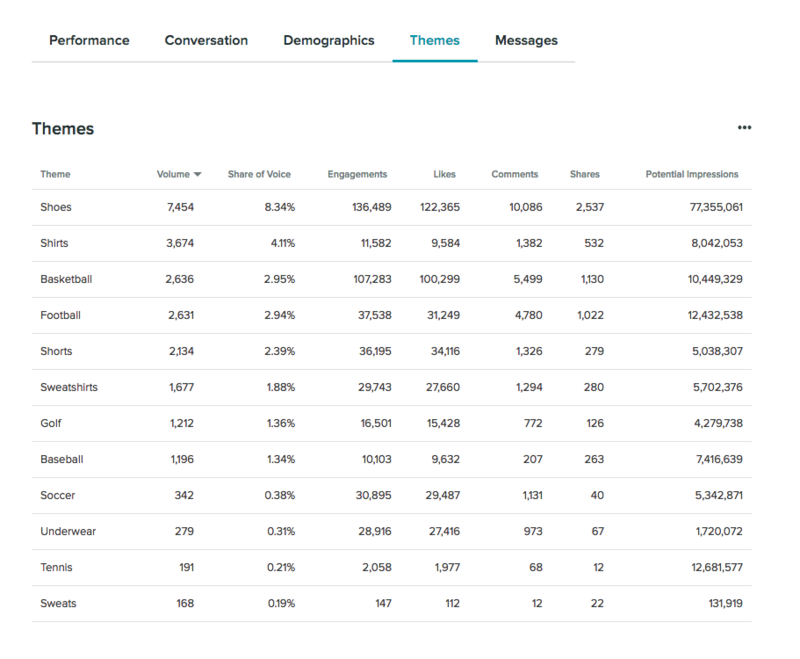 Use demographic data to see who is resonating the most with your content. Once you realize that mid-thirties women love your videos about hiking, add that to your personas or develop a new one. 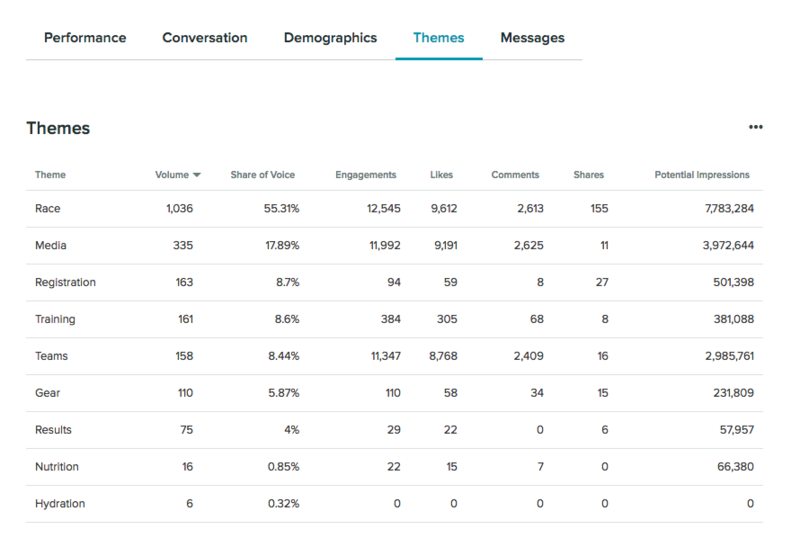 Use a hashtag report to see which are the most engaging. Use this hashtag in future posts and to find new people to follow. This report would also surface some content that’s useful for a user-generated content strategy. Identify potential influencers who are engaging with your content. Then use a potential impressions report to see what their reach would be. Social listening lets you identify ways you can improve or add to your current lineup. Because listening data is immediate, it leads to quicker action for your company. Add updates to your app or see where your competitor is missing features. If it makes sense for your brand, add those features to your own product. Let’s say you’re opening a new restaurant and you want to know what people want to eat the most in your location. 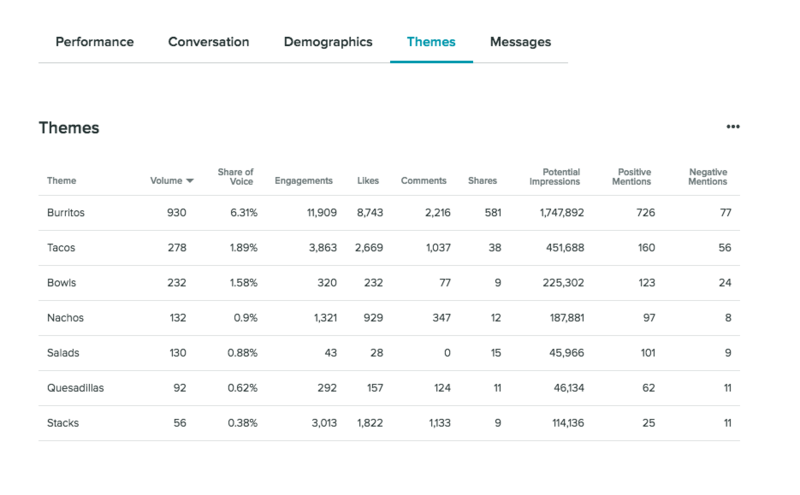 Use social listening themes to identify which products are dominating the conversation and therefore, must-haves on the menu. If this report was pulled for an existing location or a competitor, you would see which products are performing poorly and explore that more. Why do the burritos have the most negative mentions? How can you fix this? A listening report that includes locations is highly useful for growing companies. Let’s say you’re an international franchise company and you’re looking for new locations. Which locations are becoming popular travel destinations and where are your competitors opening up? If you set up the parameters correctly, you can identify your next potential locations with one report. Use this to supplement your other location research data. Monitoring industry trends to notice that more people want veggie burgers on the menu. Your restaurant doesn’t have it yet but you use listening data to see what type of veggie burger people are talking most positively about and you add it to your menu. See that negative reactions to your new eyeliner product discusses its high cost. Drill down to see if the reactions are within your target market. If so, consider lowering costs or developing a new product at a lower cost. Realize that your competitor released a new necklace but the complaint around it is its durability. Use this information to create a campaign around your own products’ materials and add to your FAQ documents. Social media listening is no longer limited to only monitoring your brand’s performance online. Instead, advanced uses of it can go as far back in your company’s development stage to the ideation phase. Every step of product development can be informed by social media listening. Setting up your monitoring and using it to inform your listening is a continual process. One day, you may be looking at how a product is being discussed online. Another day, you’ll see data for your next franchise location. The possibilities for social media listening are endless.